Nov. 2017 Trail Bytes: Fish Chowder - Make it for supper tonight, or dry it for the trail. A few months ago, I made fish chowder for supper. Dominique loves my soups, so it was no surprise that this thick chowder shot right to the top of her favorites list. I’ve made it several times since then, and for this issue of Trail Bytes, I dehydrate a batch for use on the trail. To make this meal for supper without dehydrating it, use a few tablespoons of butter, instead of oil, to cook the onion and celery. Also, before serving, add a cup or two of milk. Keep the stove on after adding the milk to heat it up, but don’t heat it so much that it boils. I omitted the butter and milk for the dehydrated meals since dairy foods won’t keep well in storage. This recipe makes five two-cup servings and goes great with warm crusty bread on the side. Photo above: Vegetables and seasonings simmering before fish was added. Cook onion and celery using one tablespoon cooking oil in stock pot over medium heat, about five minutes. 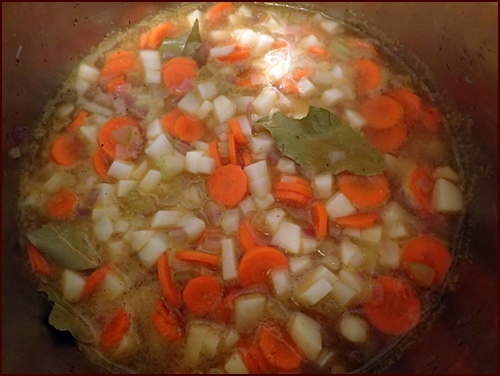 Add carrots, potatoes, all seasonings, and four cups of water to pot. Increase heat until boiling, then reduce to low and simmer for ten minutes. Add fish, return to boil, then reduce heat again and simmer for ten more minutes. If serving immediately for supper, add the milk after the fish has cooked and heat just until hot. I like to let the pot sit off the stove with the lid on for fifteen minutes or so before serving. That’s a good time to warm some fresh bread in the oven. As mentioned at the top, omit the milk if dehydrating the chowder. 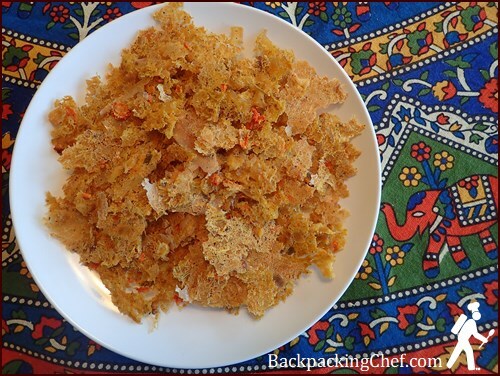 If dehydrating the meal, one more step is required. Remove six cups of chowder from the pot and blend it. This will thicken it up enough so that it won’t run off your dehydrator trays. I picked out the carrots before blending. If you don’t want to dirty your blender, you can mash one cup of chowder at a time with a spoon. Stir the blended portion back into the unblended chowder. The chowder will also thicken as it cools. Photo above: Two cups of chowder dehydrating on one Excalibur Dehydrator tray. Spread chowder on dehydrator trays covered with nonstick sheets. This recipe produces ten cups of chowder – two cups per Excalibur Dehydrator tray, using five trays. Two cups is also a serving size, so drying this quantity on each tray makes it easy to transfer the dried results directly into individual storage bags. Dehydrate at 145° F (63° C) until completely dry, approximately twelve hours. Tip: Flip the chowder over after six hours to expose the bottom of the drying chowder to more air circulation. 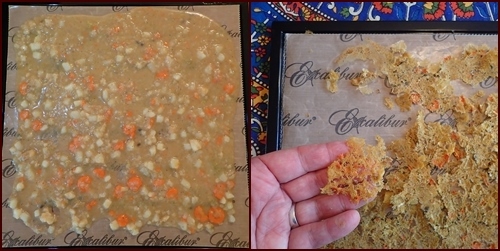 To flip an Excalibur tray, place a nonstick sheet over the tray with the food on it. On top of that, place a mesh sheet and tray. Squeeze the two trays together and turn them over so that the dried food is now bottom side up. Photo above: A closer look at dried fish chowder. It crumbles easily. The portion shown above is from two cups of wet chowder dried on one tray. The dried yield was one cup, firmly packed. Photo above: Small serving of rehydrated fish chowder prepared in a pot. The ratio of water to dried food for rehydration is 1:1 when preparing in a pot. Increase water by twenty-five percent for thermos cooking. Metric weight equivalent: One cup of packed dried chowder weighs fifty-five grams. Serving size recommendations: One cup of dried chowder rehydrated with one cup of water makes a decent-sized lunch portion, especially if you have something else to eat with it. If serving chowder for supper, or for a more substantial lunch, go with 1½ cups of dried chowder rehydrated with 1½ cups water. The chowder is delicious and becomes addictive with each spoonful consumed, so folks with hearty appetites could make a large serving out of two cups of dried chowder rehydrated with two cups of water. Confession: I had no problem eating this large serving. Combine dried chowder and water in pot. Soak five minutes. Light stove and bring to boil. Remove from heat and transfer pot to an insulating cozy. Wait ten to fifteen minutes. Add boiled water to dried chowder in freezer bag. Place bag in an insulating cozy pouch and wait fifteen to twenty minutes. Photo above: Two servings (2 cups dried chowder) prepared in a 24-ounce capacity Thermos Food Jar. 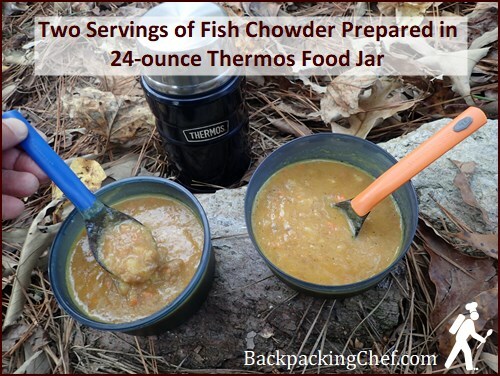 The maximum quantity of dried chowder that a 24-ounce capacity thermos food jar will hold (allowing for the water to be added) is two cups. This will produce a hearty meal for one person. Since Dominique and I carry one thermos between us, we will make the two-cup dried portion to split for lunch, and pack extra side items like tortillas with jam. Full Thermos for one large or two small servings: Add 2½ cups of boiled water to two cups of dried chowder in the thermos. Moderate Serving: Add two cups of boiled water to 1½ cups of dried chowder. Small Serving: Add 1¼ cups boiled water to one cup of dried chowder. Note that we use approximately 25% more water for thermos cooking than with other cooking methods. The food soaks up more water during the extended time between preparation in the morning and consumption several hours later for lunch. How well did the fish rehydrate? I expected the fish, which is mostly protein, to be chewy in the rehydrated meal. It was a little chewy, but not bad, since the fish was cut into small pieces. The portion that I prepared in the thermos, with a three-hour wait time before consumption, was less chewy and nearly perfect. 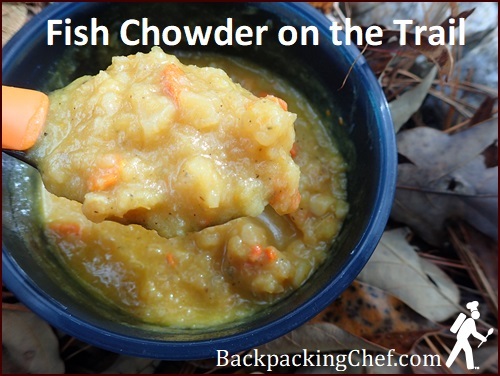 This meal will definitely be on the menu for the next backpacking trip. That’s a wrap for November. Give the fish chowder recipe a try... you'll love it. 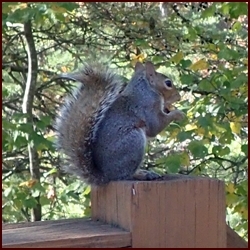 I’m sending this newsletter from my kitchen table to yours, while my little squirrel friend munches a nut on the back deck. This fall, Dominique and I enjoyed several hikes in North Georgia, a trip to Panama City Beach, Florida, and visits with friends and family. Have a wonderful Thanksgiving with your loved ones. I'll be serving my usual two Swiss chickens with all the fixings. See you in December with a recipe for Squirrel Stew. Kidding.